Finally, draw your strength from the Lord and from his mighty power. Put on the armor of God so that you may be able to stand firm against the tactics of the devil. For our struggle is not with flesh and blood but with the principalities, with the powers, with the world rulers of this present darkness, with the evil spirits in the heavens. Therefore, put on the armor of God, that you may be able to resist on the evil day and, having done everything, to hold your ground. So stand fast with your loins girded in truth, clothed with righteousness as a breastplate, and your feet shod in readiness for the gospel of peace. In all circumstances, hold faith as a shield, to quench all [the] flaming arrows of the evil one. And take the helmet of salvation and the sword of the Spirit, which is the word of God. I physically pictured myself armored for God. Into my head popped these things; frequent confession, reception of the Eucharist, Scripture reading, adoration, the Rosary, the Divine Mercy Chaplet, the Saint Michael prayer, a St. Benedict Cross, and a Brown Scapular and my Guardian Angel. Our armor rests in the Lord and He has given us the Bible, Prayer, Sacraments, sacramentals, Angels and Saints and each other. I am sure there are things I haven’t named. Which will be your armor today? It helps us to totally abandon ourselves to the Lord. I leave you with a song fitting for these times and for Trust in the Lord; Just be Held, by Casting Crowns. Susan, I just erased a rather long diatribe on the evils of this world. I am an old warrior both in a spiritual sense and a physical sense. But there is certainly no need to delve into the challenges of the battle here. Your gentleness is a testimony to the solace of confidence in the peace to come following a cleansing storm. I thank you for you words. They are a comfort and a challenge. At Adoration of the Blessed Sacrament at our Parish early Friday morning, I quietly asked our Lord several questions. Then listened. I wrote down my inner thoughts and am studying them for sighs that they may be His words, not mine. One inquiry had to do with words that were spoken out loud to me on one troubled morning a few years ago before I was aware of folks like you, Mark, Charlie and others, or the idea of a Storm. Back then I thought they applied to me as a harbinger of trials ahead for our family. Today, I sense that they are a message of true, active hope fro all from God or His messenger. Whoever this may be from, the words echo the encouragement of Padre Pio, as you began above, and so many other voices who call for diligence. 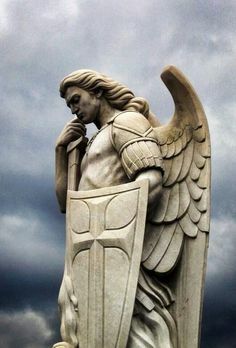 Armed with the Shield of Faith and our Blessed Mother’s promises of protection, we have nothing to fear and everything to hope for now and forever. I continue to allow the arms of the Lord to hold me and mine. It is the same with me – fear for the children, how will my husband cope with the young ones should something happen to me, how will the kids cope. And on and on it goes. This fear alone limits my prayers. Every prayer I say has the tag, Lord, please don’t take me away… I need to be there for the kids. I am now able to allow Mother Mary to take charge of their lives. I can easily admit my limitations to her. But I desperately pray that I will always be here physically for my family. This fear alone tells me I am so far away from the Lord, from Heaven. That’s not even going into my other fears. But far away from God or not, nothing stops me from going to Him. Absolutely loved this Susan, I must remember to put on the armor of God. That means I have to add a few more things to my armor. God bless you. You are truly a child God, and I’m trying to help some Christians who are lax in their faith, understand that.